By now you’re probably wondering about the food. You want details and recipes, not just updates on the rapping rabbi* and Elverace’s wardrobe, even though yesterday’s outfit earned him the surname Cash, as in almost dead ringer for Johnny Cash…if it weren’t for the receding hairline. My local market is the Rialto. ** I’m not bragging, it’s just happens to be the truth. 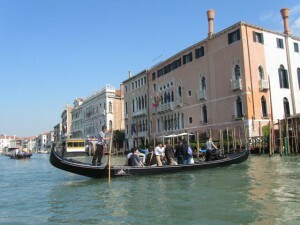 Two minutes from my door is a traghetto–a public taxi in the form of a gondola—that takes me across the Grand Canal. It deposits me in front of the market’s famed food stalls for the equivalent of 65 cents. I’m not able to stand up for the crossing as the Venetians do, but I can now get on and off without making the boat sway from side to side, no longer causing innocent, non-seafaring tourists to panic. 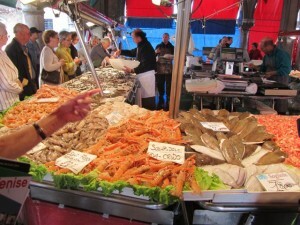 As you would imagine the covered part of the market, where the fishmongers set up, smells of fish. It’s not the pungent odor sometimes found in supermarkets, rather a blend of the sea and the creatures that long to be back in it. Rows and rows of fresh seafood sit on beds of crushed ice. The workers arrive before daybreak when dutiful chefs and diligent housewives come to scour the immense selection, taking away the jewels of the bounty. However, even at 10am, when I cross the canal, people are still lined up to buy what will become their lunch. 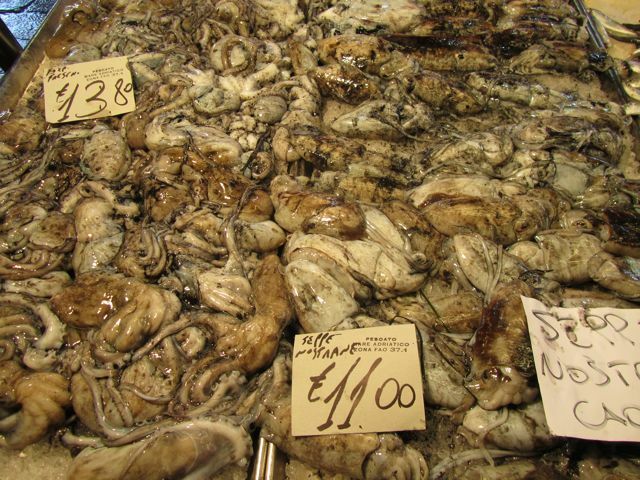 Swordfish, tuna, cod, and sea bass merge into piles of clams, mussels, shrimp, and squid. The seppie,or cuttlefish, display resembles modern art. There’s excitement in the air as apron-clad vendors, some with cigarettes dangling from their mouths, beat their large cleavers on stainless steel tables. They’re portioning and filleting fish, easing the work of the home cook as camera-wielding tourists stand nearby. 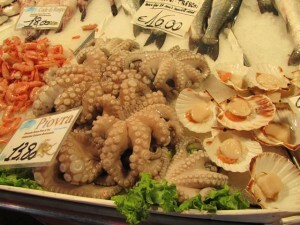 Before coming to Venice, I promised myself I would master calamari—fried, sautéed, and braised. However, when the vendor instructs me to pull out the poor creature’s eyes while taking care not to break its sack of black ink, I quickly decide to eat calamari only in restaurants. I’m not pulling out anyone’s eyes; I’m not that kind of a chef. The hustle and hum of the market is enthralling as muscled young men shout, “signori, signori,” when they want the crowds to part. They push dollies loaded with fresh fruits and vegetables, some making deliveries to restaurants, others unloading boats to restock the stalls. It’s May and subtle, sweet strawberries are everywhere—the fruit of the season. Cherries, peaches and nectarines are starting to appear and will soon be the preferred fruit of summer. Tall, thin stalks of asparagus and violet tinted artichokes are displayed next to the first offering of squash blossoms and long, slender peas. Inspiration for the cook and the eater—now I must go make lunch! See below for today’s menu (and recipe): Spinach and Ricotta Ravioli in Gorgonzola Cream Sauce with Asparagus. **The Rialto dates from 1097 and has been a constant source of fresh produce and fish for centuries, offering the largest selection in all of Venice. 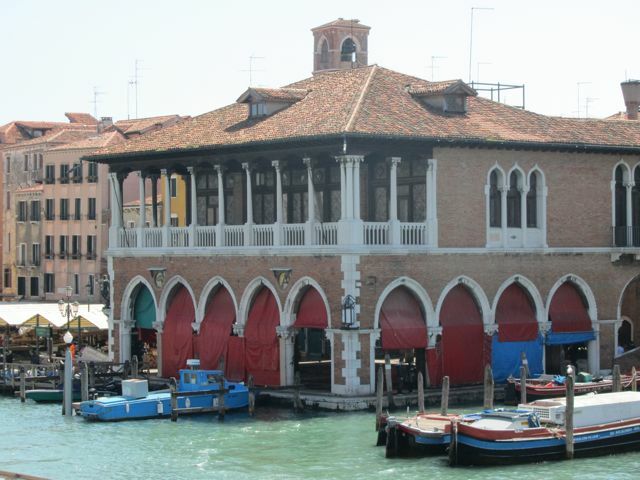 It’s location on the Grand Canal was chosen so residents could easily buy and sell imported goods, unloaded from the numerous ships that sailed into port. After a fire in the 16th century, the city constructed squares and porticoes in this area, dedicating certain spots for different products. 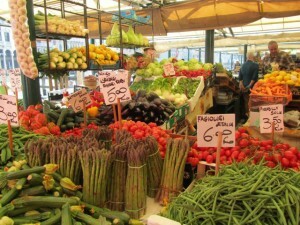 There was the naranzeria (orange market) and the speziali (spice market) in addition to the stalls you see today. The market is mentioned in both the “Merchant of Venice,” by William Shakespeare, and in “Sonnets from the Portuguese,” by Elizabeth Barrett Browning, as well as many other famous works of literature. 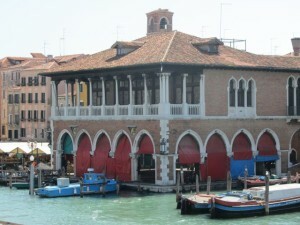 Tourist Tip #4: If you get to the Rialto at noon, when the vendors are packing up, you’ll likely to find good discounts. The freshness of their products also means it might not be meant for tomorrow. 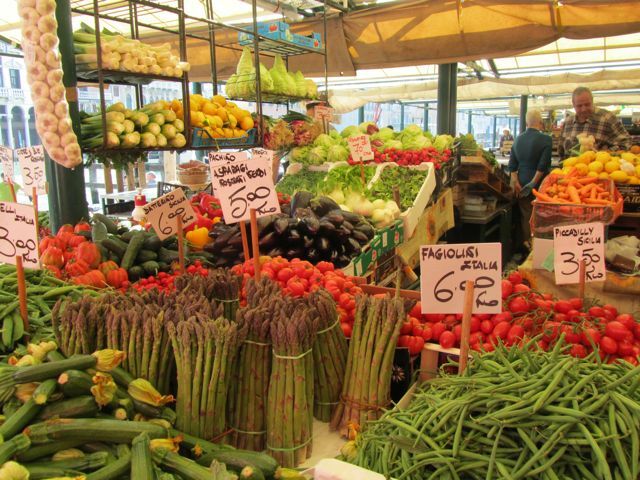 If you don’t have a kitchen, then get some fruit, grab a panini or some cichetti from a nearby osteria and you can have a picturesque, affordable lunch sitting on the banks of the Grand Canal. An added extra is that most bars let you slip out the door with flutes of prosecco or a good glass of wine to enjoy in the street, or more importantly, on the Canal. Just remember to take it back…empty, of course. 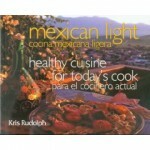 This recipe is quick and easy, not to mention tasty. The only secret is to buy quality ravioli and seasonally fresh asparagus. The quantities can easily be adjusted, depending on you preference for Gorgonzola. 1. Boil water and cook the ravioli as instructed on the package. 2. While the ravioli are cooking, place the cream and cheese in a small saucepan over medium heat. Stir occasionally until well blended. Season with salt and pepper. 3. Cut the asparagus in small pieces and add to the sauce. 4. When the ravioli are done, pass them 3-4 at a time through the Gorgonzola sauce. Plate, pouring the remaining sauce with the asparagus on top. **Optional garnishes: chopped parsley, chopped toasted pecans, a good-quality grated Parmesan cheese. I prefer doing all three. This entry was posted on Thursday, May 17th, 2012 at 4:39 am	and is filed under Italy, Recipes, Venice: The Audition. You can follow any responses to this entry through the RSS 2.0 feed. You can skip to the end and leave a response. Pinging is currently not allowed.